Wabash College President Gregory D. Hess and Dean of the College Scott E. Feller announced the promotion and tenure of three faculty members. 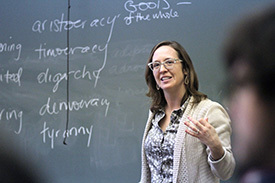 Professors Deborah Seltzer-Kelly (Education Studies), Adriel Trott (Philosophy), and Bronwen Wickkiser (Classics) all successfully completed the tenure process and will assume the rank of associate professor at the 183-year-old liberal arts institution. 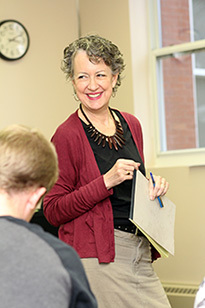 Dr. Seltzer-Kelly joined the faculty in the Education Studies Department in 2012 after serving as an assistant professor in the Department of Curriculum and Instruction at Southern Illinois University, Carbondale, from 2008-12. She earned her bachelor’s (History), master’s (History) and Ph.D. (Curriculum & Instruction) from the University of Nevada-Reno, where she also served as a Lecturer and Director of Forensics in the UNR Department of Speech Communications in 2005-08. Seltzer-Kelly’s academic interests center on diversity and multiculturalism in the classroom; epistemologies of teaching and learning; and the methodological aspects and implications of research appro aches commonly used in education. Her recent course offerings include Philosophy of Education, Diversity and Multicultural Education in High School Curriculum and Instruction, Studies in Urban Education, a seminar focused upon philosophical and/or historical issues in education, Teaching of Social Studies, Student Teaching Practicum, and a freshman tutorial that used dance as a vehicle for exploration of 20th Century U.S. Culture. She is particularly interested in working with students on their own research, and also enjoys working with students as her research collaborators and co-authors. 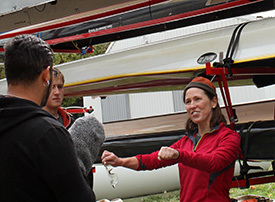 “While Debbie is probably best known as an exceptional teacher and mentor to our students who themselves are committing to the vocation of teaching, we hear in comments from students across the College that she is an especially caring faculty member who is dedicated to the success of all students,” said Dean Feller. Dr. Trott joined the faculty in the Philosophy Department in 2013, having spent the previous five years as an associate professor at the University of Texas-Pan American. She received her bachelor of arts degree in 1998 from the College of William and Mary in Government and Political Philosophy, and earned her master’s (Philosophy) and her Ph.D. (Philosophy) from Villanova University in 2003 and 2008, respectively. She also held adjunct teaching positions at Drexel, Bryn Mawr College, and the University of Pennsylvania. Trott focuses o n ancient, continental, and political philosophy. Her recent book, Aristotle on the Nature of Community (Cambridge 2013), argues that an emergent conception of nature in Aristotle’s Politics contributes to an open conception of community, one defined by an activity that moves like natural things from within themselves to fulfill themselves. She finds in ancient Greek philosophy provocations that remain pressing today, questions about what it means to be human, what it means to be good, what it means to know, and how we use nature as a ground and justification for how we live. Other philosophical influences and interests include Hannah Arendt, Michel Foucault, conceptions of sovereignty, critical race theory, feminist theory, and the history of philosophy. Trott currently runs the GLCA Ancient Philosophy Research and Teaching Collaborative Initiative which brings students and faculty in the GLCA together to share their research and to improve pedagogical practices in ancient Greek philosophy. As an honorary member of the Malcolm X Institute for Black Studies at Wabash and the Chair of the Gender Issues Committee, Trott is happy to participate in and help foster conversations on campus about race and gender as they relate to cultivating inclusive community. A member of Wabash’s Classics Department since 2013, Dr. Wickkiser joined the faculty after serving as an assistant professor in the Department of Classics at Gustavus Adolphus College (2003-07) and in the Department of Classical Studies at Vanderbilt University (2007-13). She earned her B.A. in Latin Language and Literature with High Honors from Oberlin College in 1991, and her master’s (Latin) and Ph.D. (Classics) from the University of Texas in 1996 and 2003, respectively. A member of Phi Beta Kappa, Wickkiser served as an on-site professor in Athens during the spring and fall terms in 2002. A specialist in ancient Greek history and culture, especially the intersection between religion and medicine, Wickkiser has published a book on the healing god Asclepius and co-edited a volume on Greek cult practice. Dr. Wickkiser’s interests within Classics range widely, from sacred spaces, to the poetry and art of Augustan Rome, to Classical reception. Her current book project examines performance, architecture, and acoustics in Greek sanctuaries as they relate to music therapy. A passionate proponent of study abroad, Wickkiser enjoys taking students to Greece and Italy. She also enjoys exploring with Wabash students the culture of neoclassicism here in Crawfordsville, from the Lew Wallace Study to war memorials and burial monuments. Currently, she teaches courses on Greek and Latin language and literature, and on the history and culture of Greece. These promotions are effective July 1, 2016.